Singapore Shipping Enterprises Pte. Ltd. was formed in 1991 to provide reliable and professional ship services to all types of ships in Singapore and throughout Asia. Our head office based in Singapore at crossroads between Europe and the rest of Asia, offers highly efficient services to owners’ vessels and their business in the Far East region. We provide reliable services as agents and/or representatives of shipowners for their business and ships in Singapore as well as other important shipping hubs. Our port agency in Singapore has been serving all types of vessels and handling port operations since 1991. Our experience, well established networks and our around the clock care ensure that we are able to deliver high level services to our clients and build mutually beneficial relationships. Our personnel’s in-depth knowledge of local operational conditions, regulations and policies enable us to understand and meet the requirements of our clients, and strive to exceed their expectations. Our dedicated staff of highly trained professionals consists of operation executives available 24/7 with a wide network of contacts, and an accounts team working closely together to ensure our customers’ needs are always met without any reservations. 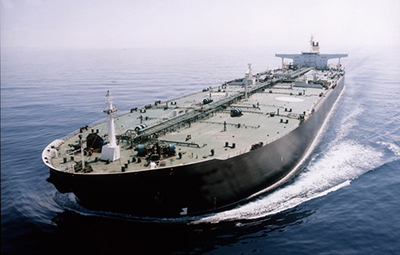 Singapore Shipping Enterprises Pte. 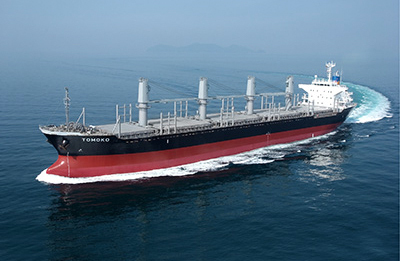 Ltd. is one of the few authorised distributors of spare parts for all engines and machinery produced by Hyundai Heavy Industries Co. Ltd. , the world’s largest builder of marine diesel engines with approximately 35% of the global market share. This award has come to highlight Hyundai’s trust for our strong customer relationships that have been built through the years, based on our continuous efforts to exceed our customer needs and expectations. 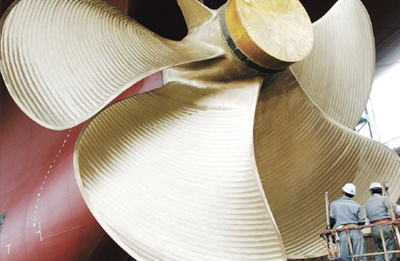 Driven by these values, we will strive to support our valuable customers with high quality and most economical supply of spares for their Hyundai engines & machineries onboard their vessels. A shipping agency is a very demanding and competitive industry, each client’s needs are unique. Our aim is to tailor SSE’s services to meet these needs and deliver them effectively on time. We provide a one-stop Agency Control Centre for vessel calls to Singapore, Malaysia, Indonesia and China by working in collaboration with our counterparts to offer the most comprehensive and professional services to all of our clients. A key component of our quality service is the ability to communicate efficiently for a timely transfer of data and to provide quick access to information regarding local port authorities’ procedures and regulations, customs and immigration formalities, and terminals. Our liaison offices are equipped with in-house communication systems to ensure all parties are notified and updated on vessels’ movements and port information. Singapore Shipping Enterprises Pte. 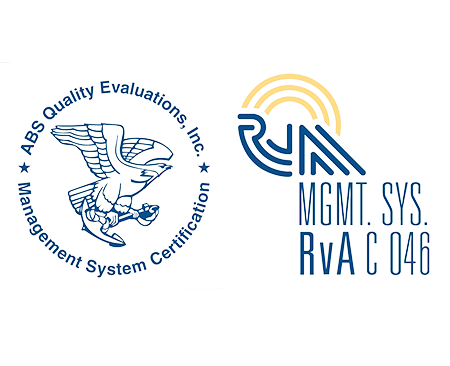 Ltd. has been certified to ISO 9001-2008 by ABS Quality Evaluations. SSE is committed to providing quality services to its clients and to be responsive to their needs. The company provides reliable and professional services and facilities to all nationality of Owners and to their vessels or their equipment as agents and/or representatives of Owners for their interests. 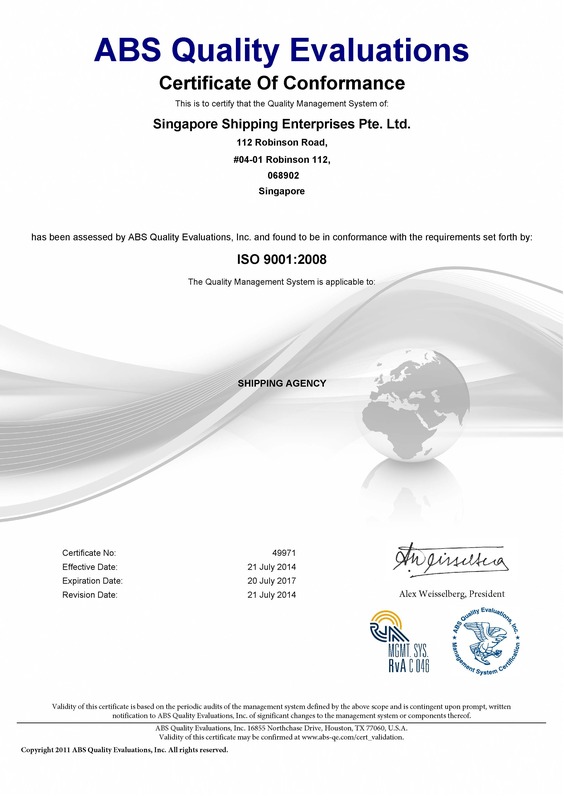 Singapore Shipping Enterprises has a commitment to comply with the clients’ requirements and to work towards continuous improvement of the quality management system.This policy requires of all employees to be responsible and participate actively in implementing and improving the quality management system to ensure that the Company’s activities are conducted within the set quality standards and high regard to the community and environment. The quality of service policy will be reviewed annually for continuing suitability.